It’s estimated that one in five people with a high body mass index (BMI) also suffer from an eating disorder – and eating disorders are on the rise. Now, a program that has had success in treating both has been launched to the public for the first time, in a hospital, by one of Australia’s leading eating disorders doctors. Named HAPIFED, the program was co-founded by Australian eating disorder psychiatrist and academic Dr Phillipa Hay, who has launched it at Wesley Eating Disorders Centre in Sydney, where she is Director. The centre, in Wesley Hospital Ashfield, treats patients Australia-wide in both a clinical and hospital setting. HAPIFED (a Healthy APproach to weight management and Food in Eating Disorders) integrates cognitive behaviour therapy (CBT) for bulimic and binge eating disorders with healthy weight maintenance, the latter focusing on healthy exercise, healthy food habits and positive weight goals. Until now, HAPIFED has only been delivered in a research setting. Dr Hay played a major role in the research and development of HAPIFED, a collaboration of a team of international researchers, and was a leading author in its dissemination. One Australian study she co-designed and co-supervised reported 75 per cent of patients lost weight, with eating disorder symptoms reduced in another 75 per cent. Wesley Eating Disorders Centre has launched HAPIFED as a group-based day treatment program, at a half-day fee. Qualified patients will begin the program with a one-hour assessment by a psychiatrist or psychologist, followed by weekly CBT sessions, and weekly patient-group sessions that incorporate a supervised meal and discussions on topics such as emotion regulation, weight maintenance, appetite regulation, body image and healthy exercise. Patients can join at any time and are expected to attend at least eight of 12 group sessions, with each group capped at eight to 12 patients. “Weight loss treatment programs alone do not adequately address psychological aspects related to eating disorders,” Dr Hay said. “Treating eating disorders cohesively is important, as a growing body of evidence is finding that they are intertwined with high BMI in complex ways. The comorbidity of eating disorders puts sufferers at an increased risk of depression, anxiety and obsessive-compulsive disorder more than individuals with only one condition, This explains why ‘diets’ often fail, and people regain weight after completion. Conversely, CBT alone does not address weight management for those with binge eating and bulimia conditions. Wesley Eating Disorders Centre’s HAPIFED program is suited to people with binge-eating disorder, non-purging bulimia nervosa, and other specified feeding and eating disorder of binge eating type who are seeking weight loss management. Promotes a healthy approach to eating. Rather than focusing on dieting, this type of program emphasises appetite awareness: focusing on eating when your body is hungry and recognising when you are full. This creates behavioural change away from binge eating and promotes a regular pattern of eating, a balanced diet and appropriately sized food portions, to achieve moderate, long-term weight loss. Encourages healthy exercise. Weight loss management promotes healthy exercise, instead of insufficient or compulsive exercise that is seen in people with weight issues and eating disorders. To bring about moderate weight loss that can be sustained, this program recommends healthy exercise equivalent to 10,000 to 20,000 steps a day. Addresses eating disorder behaviours at the base of the problem. Common ‘diet’ programs do not address eating disorders. 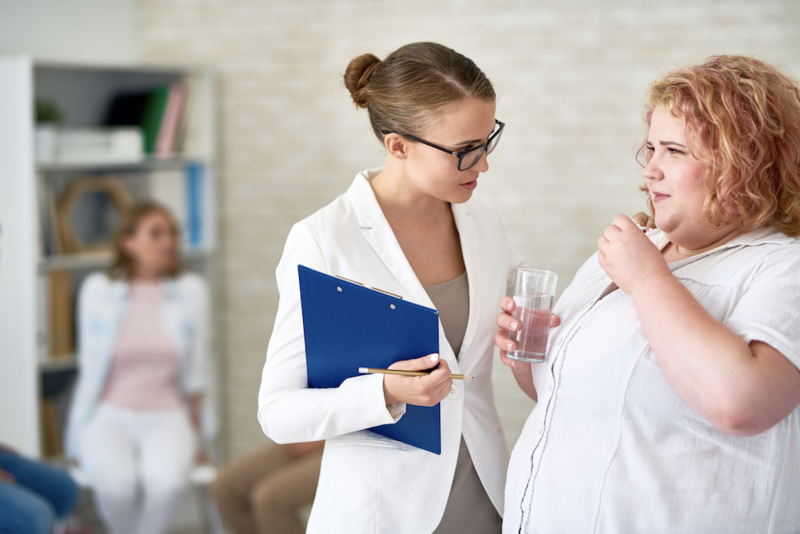 Those with binge eating and bulimia symptoms are less likely to achieve a healthy weight after undergoing weight loss treatments compared with those that do not suffer from an eating disorder. Combined CBT-weight loss management programs help people manage these symptoms, leading to sustained weight loss. Improved mental health. Individuals with a high BMI with eating disorders are more susceptible to anxiety, depression and stress than either of these conditions separately. The integration of CBT in treatment reduces these mental health symptoms. Longer-term weight loss. By treating eating disorder symptoms and weight management together, this type of program promotes a healthy and positive relationship with food and body size and is more likely to achieve active behaviour change in individuals. eating disorder behaviors from 1995 to 2005’, International Journal of Eating Disorders, 42, 104–108.